Reading opens up the world for your students. 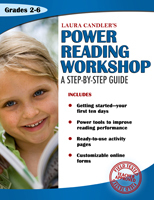 Laura Candler's Power Reading Workshop: A Step-by-Step Guide will help you teach your students to love reading. Designed by award-winning teacher Laura Candler, this book walks you through the first ten days to implement a basic Reading Workshop with your students. Then Laura shows you how to add twelve proven "Power Reading Tools" to the program to make your Reading Workshop the most effective reading instruction you will ever use. Students and teachers alike love the simplicity, fun, and excitement of Laura's Power Reading Workshop program. Everything you need, including reproducible worksheets, charts, and forms, are included to help you implement a Power Reading Workshop in your classroom today. Teachers around the world have used Laura's straightforward approach with fantastic results—that's what makes her program "field tested and teacher approved." Subscribe to Laura's free newsletter to get even more teaching tips and resources weekly, at www.lauracandler.com.